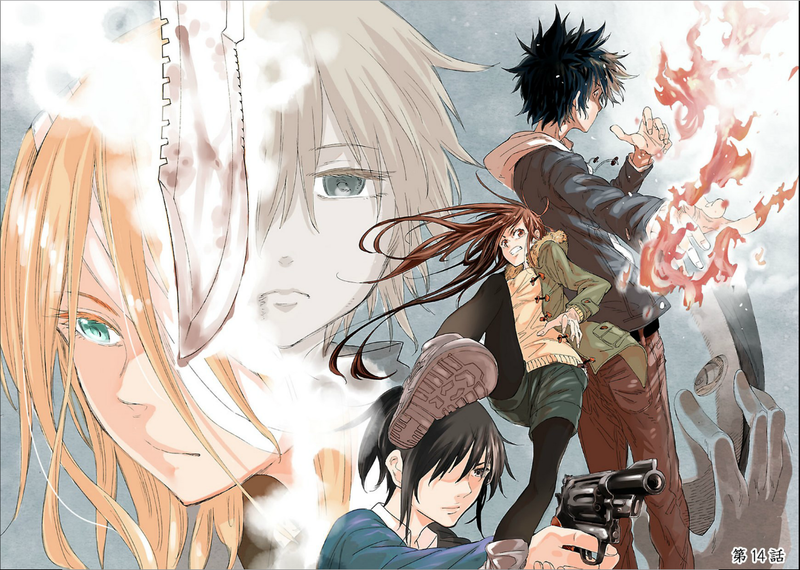 They released some color illustrations of the manga on the publishing site. When Break Blade switched to online publication on Comic Meteor website around 3 years ago, I checked out most manga they publish and I saw Haru no Houtai Shoujo. I thought it would be axed back in 2013, because after November 2013 there was no new chapter, until april 2014. Maybe the author was sick or something. Around that same time, Break Blade had no updates for a very long while too, and Break Blade chapters releases have been scarce that way until the end of 2014. It taught me that online published manga can have really weird publications schedules. At least on Comic Meteor. I’m not a specialist. While I’m on the subject, I especially dislike Comic Meteor’s holder Holp Shuppan. 3 years ago, when they bought up Flex Comix which used to publish Break Blade, they stopped every international publications. Because of that, Break Blade stopped being published in France and everywhere else but Japan, and volume 10 is the last one that was released here, since 2012. The french publisher even already translated volume 11 before that decision was made, and they were unable to publish it anyway. This also means all the great manga on Comic Meteor like Don’t become an Otaku Shinozaki, or the new Crest of the Stars manga remake, won’t be published here either. Anyway, Haru no Houtai Shoujo was a really good manga. I wish it was longer though. That could have just been the end of an arc and continuing on something else. There’s also how it got published for more than two years, but in the end we only got 1 year and a half worth of chapters, because of the hiatus I wrote about above. I’m pretty butthurt Seo Kouji is rehashing Suzuka for a third time, while good manga like this ends fast. Hopefully the author’s next manga will be just as good too. Comments on Batoto or Bakaupdates are saying it got axed, but I haven’t seen any actual evidence, and the ending wasn’t rushed, so I don’t think it is the case. If someone knows the truth I’d appreciate it if you’d let me know. Then again I don’t know how you can find evidence of that. This entry was posted in Haru no Houtai Shoujo, Opinions on..., Reccomendations and tagged Haru no Houtai Shoujo on March 14, 2015 by rockmanshii.